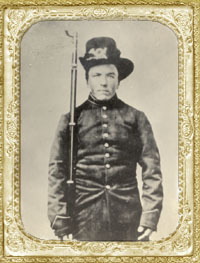 David Williams, one of the later members of the Welsh colony of Waukesha county, came to this country in the company of his parents, John and Elizabeth (Rowlands) Williams, in 1857. David, born Jan. 15, 1840, was at that time a young man of about seventeen years of age. His father died about three years after coming to Wisconsin, but the mother survived until 1880. On Aug. 20, 1862, David enlisted in Company F, 28th Wisconsin infantry as a private and served until the muster out, at Brownsville, Tex., Aug. 26, 1865. He participated in the battles of Helena and Little Rock, a number of minor engagements and took part in the siege of Mobile, where he was in active service for thirteen days and nights. He was married on Nov. 16, 1867, to Miss Mary Price, who was born in Wales, Apr. 6, 1846, a daughter of Thomas and Elizabeth Price, who came to Waukesha county in 1855, and resided on the farm which they purchased at that time until their death. Eleven children were born to the marriage. Mr. Williams has practically made his own way in the world since he was twelve years of age. He worked out by the month until the time of his marriage in 1867, when he bought 60 acres of land in Genesee township where the family lived about six years. Later he sold that place and now lives and where he carries on diversified lines of agriculture. In politics he is aligned with the Republican party, though he has never cared to participate in the struggle for public office. His religious faith finds expression by membership in the Welsh Tabernacle church of the town of Delafield. "Short schech of your fathers and mothers life"
I was born Jan. 15, 1840 in a place by the name of Belanagai Town of Hanllugan, County of Montgomryshire; North Wales, G.B.. Left home to paddle my own canoe, when I was 12 years old; had good time and happy life; having small wages the first years; but when I got to be 16 years of age I worked for big wages, I was getting $30 for a year, the highest wages going for a boy of my age. In month of April 1857 our father and mother and us children (besides John and Martha they had been in America e years before us) started for America on a Sailing Vessel, on the sea from Liverpool to New York for five weeks and six days on immigrant train from New York to Milwaukee, we settled down in Waukesha welsh settlement in month of June 1857. I worked the first year with Samuel Breese for $60 doing more work than two … men of this generation. I worked several years with Mr. Breese and William Hughes Sr. The last year that I worked with Mr. Breese I was getting $150 for a year highest wages going. In August 20, 1862 I enlisted in the Civil War Army, we went to Camp Washburn, Milwaukee to train till the 20th of December. On the 20th of Dec. our regiment 28th was ordered South. We were 1000 strong starting south. In 3 years we return with only 400. Soldier life is a hard life. I suffered good deal. I heard the doctors making remarks about me, "that little Welshman ha a darn good grit or else he would be dead". The thing that troubled me most in the hospital was I could not get a furlough to go home to die. I thought if I could get home I could die peaceable. Month of April 1865 our regiment was near Mobile Ala. Laid siege around Spanish Fort a strong fort commanding Mobile Bay and city of Mobile. We were there for 13 days under fire all the time, bullets whistling around our heads and canon ball striking big trees near of us. That's where Tom Edwards got wounded and hundred others met their death. After our artillery storm Spanish Fort to the ground and took possession of it. We were ordered to March for Fort Blakely before we got there other troops had taken it. We received orders to rest, we made the best of our time, we tore down a railroad and built a fire and boil some coffee to drink with hard tack and sowbelly, and then we laid down to sleep. We were without sleep for two weeks. But he first we heard was a bugle giving marching orders. We marched that night back to Mobile bay and took boats to cross to Mobile. By that time there was no rebels there only breastworks and fortifications. We camped on night near City of Mobile. Next morning we had marching orders to chase after the rebels, we had a brush with them few miles from Mobile, but they ran a way from us. We marched 75 miles to McIndosh Bluff on Tombigby River. We heard on that march that General Lee had surrendered to General Grant. We heard also that our dear Abraham Lincoln was assassinated. We camped there for a few days. We learned that the army we were chasing had surrendered and in a few days they sent them transports to McIndosh Bluff. We had a ride in them transports to Mobile. We camped near Mobile for some days expecting orders to be mustered out of service and go home. One-day orders came for us to get ready to March to Mobile harbor. They packed 2 regiments in a big steamer, we were singing jumping and rejoicing thinking we were starting for home. It was dark when the steamer started from the harbor; we laid down to sleep thinking we would be on the Mississippi River on our way home by morning. But when we woke up we were on middle of the ocean, by that time the boys was cursing and swearing others getting insane trying to jump overboard into the sea. Others was asking the cornnel where we were going? We were on the ocean for several days. They landed us at Brownsville Texas near Mexico border. We marched to Brownsville Texas. We stayed there till the 25th of August. We were mustered out of service and started home got to Madison Sept 20th. I have taken to much space to give account of myself. You want to know about your mother. Your mother was born April 6, 1846 in the town of Hangamanch, County Brecibsgurem, South Wales, G.B. She came to America with her Folks in the year 1855. They settled in town of Genesee, Waukesha, Co., Wisconsin. She moved to Milwaukee to work. She was getting $3 a week the last she was there. My sister Sarah and her were greatest friends. In the year 1866 Sarah and her came to a quarterly meeting at Bethesda. I invited them to come with me home to have super. They accepted my bid very willingly. We can date our friendship affair from that Bethesda quarterly meeting. We were engaged to be married in about 6 months. We were married Nov. 23, 1867 at your mother's house. Rev. Robert Evans performed the service. We were on our wedding tour to my sisters Martha to Bark River. We returned in 3 days. We bought a 60 acres farm (Minnesota Jack) there was a one room house on it. It did do for a parlor, sitting room, bedroom and kitchen. We were real happy. We bought 3 cows, and a team of oxen and an old second hand lumber wagon. We were going to Waukesha marketing after our fancy team. We were real jolly. Mother never complained. We stayed there 7 years. We sold out and bought George A. Love farm 155 acres for $7300. Paid $1200 down, paying 7 percent on the balance for good many years. All the implements and stock we had was a team of horses, 6 cows, s sheep, Old lumber wagon, plow, ?? ?, old style, cultivator. We saw hard times for several years. The year 1877 our beloved Samuel died of scarlet fever. Our relatives and friends buried him. When his father and Mother was very sick not able 5o go to the cemetery. I was very sick for several months. Our relatives and friends put in the grain that spring. There was crop failures for good many years. Very hard mater to make the interest. In the year 1890, we lost our beloved Harvey. He died July 10th. He suffered sickness for good many years; he was 5 years old when he left us. He was very fond of music and singing. He made one request when he was traveling down the ???. It sounds fresh in our ears tonight. "Sarah Ann play funeral march." That was the last request he made. At those time it was hard to make much money. Everything we had to sell was so cheap. Selling fat hogs for 3 cents a pound, wheat 75 cents a buss. barley 40 cents, oats 25 cents, milk 80 cents, for hundred pounds. But by this time the boys was great help. I did not have to pay much for hired help. It was getting better year after year. We were blessed with large family, seven boys and e girls. If only for our children your mother and I would have to end our lives in the poor house. People have been telling me often "Mr. Williams you raised a nice family not one black sheep among them." They told the truth Ma and I are proud of them. We are very much pleased this evening to see our children and grand children, relatives and friends assembled together to celebrate our 50th anniversary. I say very few parents has lived together 50 years to witness what we do this evening. We thank the Lord for saving our lives to live together for so many years. Also we thank you all for your presence in our 50th anniversary. This biographical information and photograph were graciously made available for reproduction on the 28th Wisconsin Web site by Jerry Thomasen on 6 November 1999. Mrs. Thomasen is a great-granddaughter of Pvt. Williams.